Citation: Dorostkar N, Pirzad A. Evaluation of Symbiotic Relationship between Mycorrhizal Species and Soybean under Partial Root-Zone Drying Irrigation System. Biotechnol Ind J. 2018;14(6):178. The annual world soybean (Glycine max L., Fabaceae family) production was about 334 million tons that it was obtained from 121 million hectares area harvested . Soybeans contain a variety of proteins with unique properties for the germinating seed. The characteristics of soybean foods are attributable in part to the proteins from the bean . Soybean plants can form symbiotic associations with Arbuscular Mycorrhizal Fungi (AMF) , but little is known about this relation in different irrigation systems. Agriculture is the largest water consuming sector all around the world. Therefore, water-saving methods and technologies should be implemented in irrigations. Water-saving irrigations are used to improve water productivity in recent years . Two different irrigation management practices were applied for surface irrigation as of alternate furrow and conventional furrow. In alternate furrow irrigation, a furrow was irrigated and adjacent furrow was left non irrigated. In conventional furrow irrigation, every furrow was irrigated. Furrow ends were closed and runoffs were prevented in both furrow management systems . Furrow irrigation is used by farmers in non-limited or even water-limited areas. In this method, crops receive full evapotranspiration requirements to result in the maximum yield . Among the surface irrigation methods, furrow irrigation is used for row crops. Furrow irrigation can be operated in two fashions, either as conventional furrow or as alternate furrows just based on available water resources . Partial (constant or alternate) root-zone drying irrigation is the water-saving irrigation methods that cut down irrigation amounts of full irrigation to crops [4,8]. Crop production in tropical soils requires large amounts of chemical fertilizers, a serious impact on the environment , which enhance nutrient release and availability of plant nutrition . Arbuscular mycorrhizal fungi greatly enhanced the ability of plants to take up phosphorus and other nutrients those are relatively immobile and exist in low concentration in the soil solution, consequently play an essential role in plant growth [11,12]. The mycorrhizal hyphae with a diameter of 2-5 μm can penetrate the soil pores inaccessible to root hairs (10-20 μm), absorb non-available water  and capture nutrients from the soil of all ecosystems . It was reported that the mycorrhizal soybean plants produced less drought-induced pod abortion than non-mycorrhizal plants, because of increasing photosynthesis, photosynthetic storage and export at the same time . Higher root length and root volume in mycorrhizal plants were reported to increase water uptake in these plants [16,17]. The objective of this study was to evaluate the effect of three species of mycorrhizal fungi on the yield (qualitative and quantitative) of soybean under three furrow irrigation systems including partial root-zone drying. To evaluate effect of irrigation systems on the growth of soybean (Glycine max L. cv. Williams) in mycorrhizal symbiosis, a split-plot experiment was conducted based on Randomized Complete Block Design (RCBD) with three replications at Urmia University (37.53 N and 45.08 E, altitude 1320 m, West Azarbayjan Province, Urmia, Iran) in 2015. Treatments were irrigation systems (constant partial root-zone drying irrigation: CPRD, furrow, and alternate partial root-zone drying irrigation: APRD) as main plots and mycorrhizal species (Funneliformis mosseae, Rhizophagus intraradices, Simiglomus hoi and non-AMF inoculated treatment) as subplots. The mycorrhizal inocula, a mixture of sterile sand, mycorrhizal hyphae and spores (20 spores g-1 inoculum) and colonized root fragments, were provided by Department of Plant Protection, Urmia University. The sample consisted of soil obtained from two layers 0-30 and 30-60 cm deep of a clay texture. Soil physical and chemical characteristics, shown in TABLE 1, were determined . The climatic attributes of the experiment site included rainfall, relative humidity and temperature were shown in FIG. 1. 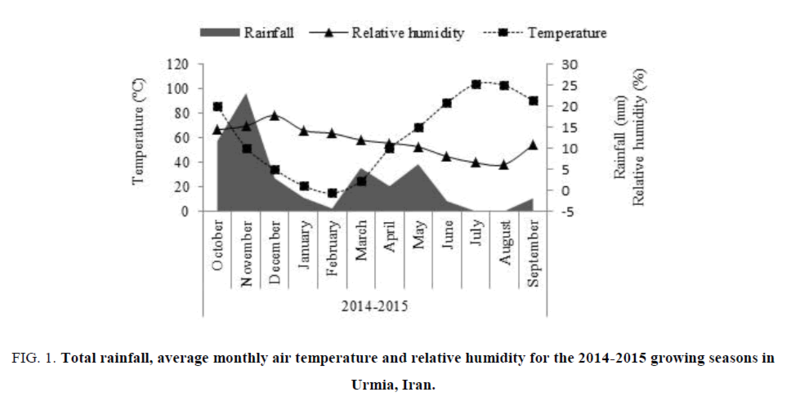 Figure 1: Total rainfall, average monthly air temperature and relative humidity for the 2014-2015 growing seasons in Urmia, Iran. Table 1: The soil characteristics of the experimental site. The biological fertilizers (AMF inocula) was placed in the holes (5 g per hole) through the plant seeds and lightly covered with soil. For non-AMF inoculated plants, seeds were planted with no inoculation. Soybean seeds were sown on 26 April 2015 by hand in the soil at a depth of 4 cm in plots of 200-by-300 cm size, with a plant spacing of 50 by 8 cm. Plants were monitored carefully in growth duration and weeds were controlled manually during the experiment. After sowing, all plants were given a pre-emergence irrigation. At the end of growing season, seeds were harvested on 12 October for furrow and 30 October for CPRD and APRD. The 30 plants of per plot were harvested and the root systems were separated from the shoots. Soybean seeds were harvested when immature at the R8 stage of development when the pods have full-size seeds. In this stage, plant height, nod number per plant and stem diameter were determined in 10 plants . Aerial parts of the 30 plants were dried in a forced air oven at 70°C for 2 days and their dry weights were obtained as pod weight and biological yield. The seeds of harvested plants were separately weighted as seed yield. To measure 100 seed weight, we weighed four samples of 100 seeds for each experimental unit. The allocation, harvest index, of photosynthate to the seeds (Seed HI) and oil (Oil HI) were calculated based on harvested seeds from 30 plants for the experimental unit. Analysis of variance (ANOVA) on data was performed using the general linear model (GLM) procedure in the SAS 9.1 software. The LSD Test was applied to compare treatment means using the MSTAT-C software package. Analysis of variance showed the significant effect of irrigation systems on the nod number per plant, seed HI and oil HI (P ≤ 0.05) and SPAD (P ≤ 0.01). However, there was a significant effect of mycorrhizal fungi on the SPAD, leaf P, and oil HI (P ≤ 0.05) and leaf K and seed HI (P ≤ 0.01). There was significant interaction effect of “irrigation systems × mycorrhizal species” on the colonization and leaf N, seed yield and oil yield (P ≤ 0.05) and plant height, stem diameter, 100-seed weight and biological yield (P ≤ 0.01) (TABLES 2A-D). Table 2a: Analysis of variance (mean of squares) of the effect of the irrigation system and mycorrhizal species on the physiological traits and root colonization of soybean (Glycine max L. cv. Williams). Table 2b: Analysis of variance (mean of squares) of the effect of the irrigation system and mycorrhizal species on the nutrients and osmolytes of soybean (Glycine max L. cv. Williams). Table 2c: Analysis of variance (mean of squares) of the effect of the irrigation system and mycorrhizal species on the morphological traits of soybean (Glycine max L. cv. Williams). Table 2d: Analysis of variance (mean of squares) of the effect of the irrigation system and mycorrhizal species on the yields and harvest index of soybean (Glycine max L. cv. Williams). The physiological parameters (LAI, SLA, LAR, LWR, seed protein, soluble sugar, proline, pod weight, and oil percent) were not significantly affected by the irrigation system and mycorrhizal species. The total means of LAI, SLA, LAR, LWR, seed protein, soluble sugar, proline, pod weight and oil percent, were respectively 3.371, 14.238 m2 kg-1, 6.2887 m2 kg-1, 0.4414 g.g-1, 32.1%, 175.34 mg g-1, 17.39 mg g-1, 786.03 kg ha-1 and 17.55% (TABLES 2A-D). The highest chlorophyll index (13.67 SPAD) was observed in plants irrigated by APRD system followed by CPRD, reducing to the minimum value in furrow irrigation. It seems that the chlorophyll index of soybean plants depended on water supply. The lowest leaf chlorophyll content was observed in soybean plants inoculated with R. intraradices (6.94 SPAD) followed up non-AMF inoculated plants as well as F. mosseae and S. hoi (TABLE 2A). The lowest leaf phosphorus content (0.1511%) was obtained from non-inoculated control plants that the plants inoculated with three species of the mycorrhizal fungi exhibited the highest leaf phosphorus of soybean plants, identically (TABLE 2B). In mycorrhizal plants inoculated with F. mosseae, leaf potassium content showed a sharp decline compared with other two fungi species. The plants inoculated with R. inraradices and S. hoi had no significant difference with untreated control soybean plants, in terms of leaf potassium. All three irrigation systems have the same leaf K and P regardless mycorrhization (TABLE 2B). The seed HI and oil HI were higher in the furrow and CPRD irrigation system than that APRD one. There were no significant differences between non-inoculated control plants and the mycorrhizal plants (S. hoi) in terms of seed HI and oil HI. In plants inoculated with F. mosseae and R. intraradices, the seed HI and oil HI were higher than that non-AMF inoculation (TABLE 2D). The highest root colonization (58.67%) was shown in the APRD system inoculated with F. mosseae as much as CPRD. The two other species of arbuscular mycorrhizal fungi colonized the soybean roots to less than non-AMF inoculated plants. There were no significant differences between non-inoculated control plants and the mycorrhizal plants inoculated with R. intraradices and S. hoi in term of colonization percentage (FIG. 2). Figure 2: Means comparison of root colonization percentage of soybean (Glycine max L. cv. Williams) affected by irrigation systems × mycorrhizal species: The dissimilar letters show significant differences at P ≤ 0.05. The leaf nitrogen content in plants inoculated with F. mosseae was higher than the other treatments in the furrow system followed by the plants inoculated with S. hoi and R. intraradices, respectively. The mycorrhizal plants of CPRD did not have significant differences with non-inoculated control plants. In the APRD, the highest leaf nitrogen content (5.92%) was observed in the mycorrhizal plants inoculated with R. intraradices (FIG. 3). Figure 3: Means comparison of leaf nitrogen content of soybean (Glycine max L. cv. Williams) affected by ?irrigation systems × mycorrhizal species?. The dissimilar letters show significant differences at P ≤ 0.05. The highest plant (63.83 cm) belonged to mycorrhizal (R. intraradices) plants as high as inoculation with S. hoi and F. mosseae. The non-inoculated control plants of all irrigation systems exhibited the same plant height. There were no significant differences among the mycorrhizal plants of CPRD and APRD (FIG. 4). Figure 4: Means comparison of plant height of soybean (Glycine max L. cv. Williams) affected by ?irrigation systems × mycorrhizal species?. The dissimilar letters show significant differences at P ≤ 0.05. Secondary growth (stem diameter) can be stimulated under conditions of water deficit stress, so in APRD and after that in CPRD, stem diameter of untreated plants was greater than inoculated plants with three species of fungi. In the appropriate water supply conditions in the furrow system, the stem diameter of the inoculated plants was the same with non-AMF inoculated (FIG. 5). Figure 5: Means comparison of stem diameter of soybean (Glycine max L. cv. Williams) affected by irrigation systems × mycorrhizal species: The dissimilar letters show significant differences at P ≤ 0.05. In the furrow system, the plants inoculated with R. intraradices had the greatest 100-seed weight (14.71 g) as well as the 100-seed weight of inoculated soybeans with F. mosseae and S. hoi. In APRD and CPRD systems, there were no significant differences between the mycorrhizal plants and control plants in terms of 100-seed weight. It was the lower in APRD irrigation than that CPRD (FIG 6). Figure 6: Means comparison of the 100 seed weight of soybean (Glycine max L. cv. Williams) affected by irrigation systems × mycorrhizal species: The dissimilar letters show significant differences at P ≤ 0.05. The highest yields (6131 kg/ha for biological yield and 2607 kg/ha for seed yield) were obtained from soybean plants inoculated with R. intraradices in furrow irrigation followed by F. mosseae and S. hoi inoculation. In other irrigation systems (CPRD and APRD), there were no significant differences on biological and seed yield of mycorrhizal plants, identical with untreated control plants (FIG.7 and 8). Figure 7: Means comparison of the biological yield of soybean (Glycine max L. cv. Williams) affected by irrigation systems × mycorrhizal species: The dissimilar letters show significant differences at P ≤ 0.05. Figure 8: Means comparison of seed yield of soybean (Glycine max L. cv. Williams) affected by irrigation systems × mycorrhizal species: The dissimilar letters show significant differences at P ≤ 0 .05. The means comparison showed that the maximum yield of seed oil (514.9 kg/ha) was obtained from furrow irrigation mycorrhizal (R. intraradices) plants. Furrow irrigation exhibited the higher oil yield than that CPRD followed by APRD. In mycorrhizal plants, the minimum yields of oil belonged to inoculation with S. hoi regardless irrigation system (FIG. 9). Figure 9: Means comparison of oil yield of soybean (Glycine max L. cv. Williams) affected by irrigation systems × mycorrhizal species: The dissimilar letters show significant differences at P ≤ 0.05. The highest concentrations of Gadoleic, Oleic acids (unsaturated fatty acids), Myristic, Palmitic and Stearic acids (saturated fatty acids) belonged to non-AMF inoculated in CPRD irrigation system. Also, the highest concentrations of Palmitoleic and Arachidic acids were respectively observed in non-AMF inoculated of APRD and AMF-inoculated of furrow irrigation. While the highest Linolenic and Linoleic fatty acids were shown in mycorrhizal plants of APRD. The Linolenic and Linoleic unsaturated fatty acids, more than 55% of total fatty acids of soybeans, were found in maximum percentage in arbuscular mycorrhizal inoculated plants of APRD irrigation system. The Oleic acid, a C18:1 unsaturated fatty acid, with 27% of total fatty acids, was the third great component of soybean oil (TABLE 3). Table 3: Soybean fatty acids components in AMF-inoculated and non-AMF inoculated plants in CPRD, furrow, and APRD irrigation systems. Low chlorophyll index under drought conditions was reported as a result of lower chlorophyll synthesis and higher chlorophyll breakdown . Chlorophyll loss was shown to be accompanied by the damage of the mesophyll chloroplasts, which lead to a lower photosynthetic rate . The greater P uptake in plants inoculated with AM fungus can be attributed to the transport of P by the AM fungus due to a rise in root volume and more access to wider rhizosphere in order to facilitate absorption process and solution of insoluble P [29-31]. In AMF-inoculated plants, an increase of P and K uptake caused resistance against water deficit stress. Accordingly, the response of mycorrhizal plants to stress and K content are closely related . Leaf phosphorus was diluted by limited irrigation, so the minimum leaf P was observed in severely stressed plants . Leaf phosphorus accumulation in soybean plants inoculated with fungal species was higher than non-AMF inoculated control plants (TABLE 2B). Means comparison of HI shows that there is a significant difference between irrigation methods with the superiority of furrow, CPRD, and APRD. Thus, we reached to the conclusion that in-furrow, CPRD, and APRD, methods by following the reduction in irrigation intervals resulted in higher grain yield against biological yield and increase in the HI . Deficit irrigation water was one of the factors that limited plant growth which subsequently reduces dry matter production, and interferes the behavior of carbohydrate in order to decrease the HI . It was previously reported that the inoculated plants significantly demonstrated higher levels of root colonization by R. intraradices and F. mosseae. They showed that the highest root colonization belonged to AMF inoculated plants up to 83% and 77% for R. intraradices and F. mosseae, respectively at an irrigation carried out after 120 mm of pan evaporation (severe stress) . Mycorrhizal symbiotic establishment and consequently improved the performance of crop may be due to more extension of mycorrhizal hyphae and more availability of macro and micro-nutritional elements in soil [36,37]. Results on soybean showed that AMF inoculation increased around 20% of root colonization; nutrients analyses in vegetal tissues showed an increase of P and N content in inoculated plants, and these results reflect in a higher yield . Colonized plants produced greater dry matter against lesser water consumption compare with non-AMF inoculated plants. On the other hand, mycorrhizal plants require lesser water than non-inoculated plants to produce 1 g dry matter. It shows that mycorrhizal plants are able to maintain higher tissue water content while imparting greater drought resistance [39,40]. The control treatment (furrow irrigation) had the highest grain yield followed by alternative furrow irrigation (APRD) and fixed furrow irrigation (CPRD) (FIG. 8) is in agreement with results published by Tagheianaghdam et al. . The drought-induced decrease of plant height could be compensated by some biological treatments included mycorrhizal and bacterial inoculation. On the other hand, these treatments lengthened plants more than they did in the case of non-mycorrhizal plants of each irrigation level . The earlier studies exhibited that the highest seed and biological yield were obtained from mycorrhizal (G. intraradices) well-watered plants . The lowest seed and biological yields were obtained from non-mycorrhizal plants in all irrigation regimes similar to the bacterial infected ones. Our findings indicated that the mycorrhizal symbiosis clearly increased the yield of biomass, seed and seed oil compared with the non-mycorrhizal under all three irrigation regimes. These reports showed that AM colonization was the most important factor for plant development, especially under water deficit condition due to a vital role in nutrient and water deficiency management of plants [41,42]. The first evaluation of AMF colonization for two soybean varieties showed that inoculated plants increased root colonization up to 20% more than non- inoculated control plants . This result shows that the partial root-zone drying treatments had higher yield benefits compared with conventional deficit irrigation practices, as reported also by Sepaskhah and Ahmadi . The positive effect of AMF-inoculation on biomass production or the content of oil depends on the species of plant or fungi . The beneficial roles of AMF-inoculation on the improvement of quantitative and qualitative yields have been reported by previous studies [45,46].